Guardsman helps you protect your investment and keep your furniture looking great for as long as possible. You can relax, assured that you have an furniture expert to call on when you need one. Watch this video to see a sample of the types of coverage offered by Guardsman Furniture Protection Plans and see furniture repairs in action. Guardsman’s most comprehensive Furniture Protection Plan that protects your new fabric, leather, and wood furniture investment. When you invest in new furniture, you want to keep it looking great for as long as possible. The Guardsman Gold Furniture Protection Plan is about giving you total peace of mind. 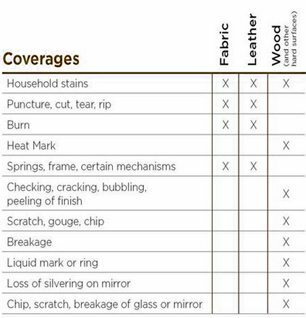 Whether your furniture is fabric, leather, or wood, damage and stains are covered by the Guardsman Gold Furniture Plan.